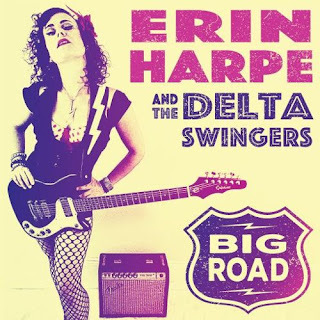 I just had the opportunity to review the most recent release, Big Road, from Erin Harpe and the Delta Swingers and it's really enjoyable. Opening with Mississsippi Fred McDowell's Kokomo, Erin Harpe takes on traditional blues with a slashing slide and solid vocals. With Jim Countryman on bass, Matt Prozialeck on harp and Kendall Divoll on drums, this is great stuff! With classic Mississippi John Hurt style, Frankie gives Harpe the opportunity to demonstrate her solid story telling blues style and finger picking acuity. Response on harp by Prozialeck adds polish to this modern interpretation of a classic track. Slim Harpo's Shake Your Hips has a more modern "Stones" feel. Harpe lets it loose on guitar and Divoll really hammers, reinforced by Countryman and pumped up by Prozialeck really delivering the goods on this super boogie. Original track, Stop & Listen is a real driver in classic blues style. Prozialeck sails on harp and Harpe's slippery slide work gives this track great support to her own super vocals. Randy Newman's bluesy ballad, Guilty, is food for Harpe's transition to the conclusion of this release with clean acoustic guitar accompaniment and solid vocals. Very nice. Wrapping the release kicks it all with funky, Gimme That (Somethin' Special) with a heavy bass groove, and modern vocals. This is a cool jam with all of the blues attributes but including harp. Great closer. A long time ago in a galaxy far, far away, I was fortunate to play with Erin and Jim. Great people and great musicians playing REAL music. You definitely need to check them out.